Join us in thanking Marilyn for over 29 years of service as our Director of Religious Education! Submit a photo, memory, or note of appreciation and join us for a special celebration in honor of Marilyn on May 27th! We are blessed each year with an opportunity to support the great work of the Catholic Church of Western Washington through the Annual Catholic Appeal (ACA)! In addition, every dollar raised above our goal for the ACA, is returned to our Parish in the form of a rebate towards a parish project. This year, we are "moving front and center" to make significant repairs to the front of the Priory and center doors of the Church. Our share of this year's Annual Catholic Appeal is $96,001 and our need for these additional repairs is $50,000, bringing our parish goal to $146,001. Would you consider matching our average gift of $499, or giving even more? 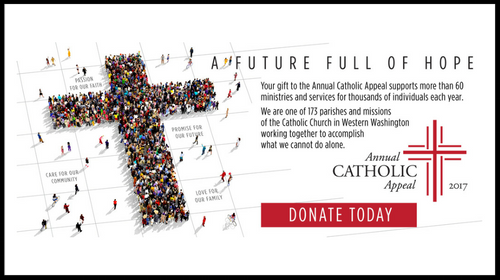 Click here to donate today to support the needs of our archdiocese and parish! Join us for a candlelit evening of quiet prayer and adoration, with contemplative music and the Sacrament of Reconciliation. Stay for minutes or the full 3 hours as you encounter the mercy of our Lord!